This is an excellent tool for outdoor lovers with either Apple or Android devices and by downloading the app, people are able to support SCA’s mission of building new generations of conservation leaders. The Student Conservation Association (SCA), the national leader in youth service and stewardship, and American Park Network, creator of Oh, Ranger! ParkFinder™ app, announced today that Ford Explorer will donate $1-per-download, up to $150,000, to SCA and three other nonprofit organizations. The free Oh, Ranger! ParkFinder™ mobile app finds nearby parks based on the user’s preferred location and activities. SCA and the other nonprofit partners, each of which have integral ties to public lands and the great outdoors, will be given funds in proportion to the votes received. The download process enables users to direct funding to their favorite nonprofit partner, and those who already have the app are able to direct funds after installing an updated version of the app. The summer campaign will continue through September. Oh, Ranger! ParkFinder™ allows users to search the most comprehensive database ever assembled of public lands all over America. The user simply chooses a location, selects their favorite activities and, in an instant, they’re presented with a host of options from near to far. Many additional features will make this an indispensable tool for anyone interested in exploring the outdoors. To download Oh, Ranger! 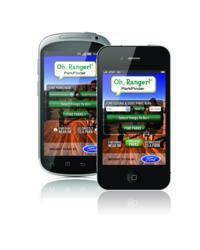 ParkFinder™, visit the iTunes App Store or Google Play, or go to OhRanger.com/app/parkfinder. Ford Motor Company, a global automotive industry leader based in Dearborn, Mich., manufactures or distributes automobiles across six continents. With about 164,000 employees and 70 plants worldwide, the company’s automotive brands include Ford and Lincoln. The company provides financial services through Ford Motor Credit Company. For more information regarding Ford’s products, please visit http://www.ford.com.